Do you ever get into a snack rut? Hey, even Snack Girl finds herself eating the same thing over and over again. I received an e-mail from Brendan, and thought I would try to help him out. Really enjoying your blog! As a man who craves a snack in the middle of the afternoon (I'm an elementary-school teacher here in Mass), would you consider soliciting ideas for 2 ingredient quick-snack combos? Something like apples/peanut butter or even pickle spears wrapped in turkey slices. There must be some fun combinations I've never even imagined. As a woman, I can tell you that I also crave a mid-afternoon snack. At around 3 PM, my head starts to hit my desk as I swoon from exhaustion (because sitting here and typing is SO taxing). I cannot imagine what it is like to attempt to teach a room full of elementary age students without a quick snack. Hang in there, Brendan. I tried to imagine how little time you have if you teach kids for a snack. Also, I thought that Brendan probably wouldn’t have a stove, blender, or toaster to use to make it. These snacks are as simple as I can get. I started with Brendan’s ideas since they rock. 1. Apple slices and peanut butter. 2. Turkey slice wrapped around a pickle. 3. Hummus and any raw veggie (carrots, celery, broccoli). 4. 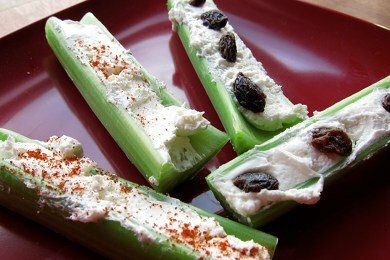 Celery and whipped cream cheese or peanut butter. 7. Banana mashed on whole wheat tortilla. 8. Baby Bell cheese and whole wheat crackers. 9. Cottage cheese and raisins. 10. Avocado half and spoon. 11. Strawberries and square of dark chocolate. 12. Rice cake and peanut butter (or almond butter). 13. Cheese stick and apple slices. 14. Greek yogurt and chopped walnuts. 15. Cherry tomatoes and sliced turkey. 16. Dried apricots and cube of cheddar cheese. 17. Hard boiled egg with freshly ground pepper. 18. Cantaloupe chunks and ham slices. Please help Brendan with his snack problem. What are your favorite two ingredient snacks? - raisins (spaced along the celery, stuck to the cheese, they are the "ants". What about laughing cow reduced fat wedges? I'm not sure if I've ever seen them in your blog. Cottage cheese with cherry tomatoes or with cucumbers; grapes and cheese; turkey and cheese rollup; plain yogurt with fruit; mini whole wheat bagel with nut butter. Light Laughing cow cheese on pear yummy ! Laughing Cow reduced fat cheese wedge spread on two Rye Krisp crackers. Fresh figs roasted with a splash of olive oil, dried dates stuffed with cream cheese or an almond, greek yogurt and anything sweet or savory. The laughing cow cheese on the Rye Krisp crackers is an excellent snack. You could also do deli ham with swiss cheese on the Rye Krisp crackers. So yummy! You can also get snack packs of tuna with crackers at the store. Those are good too and very portable. Cottage cheese and apple butter. Nutella and crackers. Don't know how healthy those snacks are, but they're delicious! How about sunflower seeds and raisins mixed. Pines nuts and other dried fruit such as apricots or punes. Will get you going in may ways then one! Wasa multigrain cracker (1 WW PP) and laughing cow light wedge (1 WW PP). I particularly like the Strawberry Cream Cheese flavor! Boiled egg with soy sauce. Small Apple and a low fat string cheese. slice of ham or turkey wrapped around 1/4 avocado, dry cereal, anything on Rye Krisp, carrot sticks with olives, cherry tomatoes, lattes! Radishes (or celery, carrots, peppers) and guacamole (mash 1/2 avocado, a little olive oil, garlic, lime juice, and salt/pepper). Cucumber slices with salsa spooned on top, great when you are craving nachos chips! Dried apricots and walnut halves are delicious! Also, prunes with a dab of peanut butter. I Am Awake At Night (Guess I'm At European Time) Viewing Cartoon Reruns. At Approximately 3 A. M. Mountain D.S.T. AWhilst ''Being Ian'' Is Being Displayed At The Qubo Station (It Changed To 11 P. M.) I Am Experimenting With Snacks. Soaked In Soy Butter Soy Croutons. I love Laughing Cow! For that matter I love any kind of cheese or cheese product. I like the Cow and other spreadables on Triscuits or veggies like cherry tomatoes, carrots, cucumbers, celery, etc. I also like the veggies with Greek yogurt Ranch. Of course the apples and PB are still a favorite! watermelon or grapes and good cheddar cheese. My very favorite in the whole world!!!! My favorite...a Medjool date and pecan halves (or walnuts). Sweet and chewy; tastes like a cinnamon roll!